Jeju Island has convenient international and domestic accessibility via direct or transit flight from major cities of Northeast Asia including Seoul, Busan, Tokyo, Osaka, Taipei, Hong Kong, Beijing and Shanghai. Jeju Int'l Airport has a total of 25 direct airlines (14 local, 11 international), linking major Asian cities employing 130 aircrafts including Boeing 747s and Airbus planes. 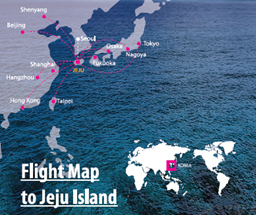 There are international routes connecting Jeju and Major Asian cities like Tokyo, Osaka, Fukuoka, Beijing, Shanghai, Dalian, Changchun, Shenyang, Honk Kong and Taipei, accounting for 94% of the travelers to Jeju using these flights. Jeju Airport can handle up to 23 million passengers annually. Transfer through Incheon Int'l Airport, bus transfer to Gimpo Int'l Airport (GMP - the second airport of Seoul) and then to Jeju Island. Transfer through Gimpo Int'l Airport from Haneda (Tokyo), Kansai (Osaka), Nagoya, Shanghai, Beijing, Song Sang (Taipei) and then to Jeju. Transfer through Gimhae (Busan) Int'l Airport from overseas and then to Jeju. * These schedules can be changed according to an airline situation. For more information, please visit www.airport.co.kr. After arriving at INC and completing the customs clearance procedures, go to the transfer desk on the 1st floor and receive your boarding pass. Board a plane to Jeju from the departure level (3rd floor). * From Incheon Int'l Airport, there are a few flights to Jeju Island with Korean Air, Asiana Airlines and Tway Air with a flight time of approximately one hour. However, airlines currently operate 4 times a day flights from Incheon Int'l Airport to Jeju Int'l Airport. If your connection time at Incheon Int'l Airport is not adequate to transfer, you had better use No. 4 as below. This schedule can be changed according to the situation of the airline; for the latest information on airlines, please check their website as follows. Arrive at Incheon Int'l Airport and follow the process below. Use ground transportation including Limousine Bus, AREX and Taxi. The distance between two airports is about 42 kilometers (26 miles) and it takes about 35 minutes by car or by limousine bus. Duration 30-40 min. 40 min. Interval 10-20 min. 10-20 min. How can I buy a ticket? Where is the bus stop? - Next to the Gate 9 on the 1st floor. - Buy ticket directly when getting on the bus. * Incheon International Airport Station is on the B1 floor in the Transportation Center. AREX's service is provided by both commuter and express trains. How can I buy a ticket? Where is the station? Fare 10 - 20 min. Travelers can use at taxi platform in front of each office building. Get off at Domestic Terminal and obtain a boarding pass at the airline check-in desk on the 2nd floor. There are 50 to 70 flights every day from Gimpo Int'l Airport to Jeju with Korean Air, Asiana Airlines, Jeju Air and Jin Air and the flight time is approximately 50 minutes. For flight schedules, please check the airline websites. Arrive at Gimpo Int'l Airport by an international flight from Haneda, Kansai, Nagoya, Shanghai, Beijing, and Song Sang. 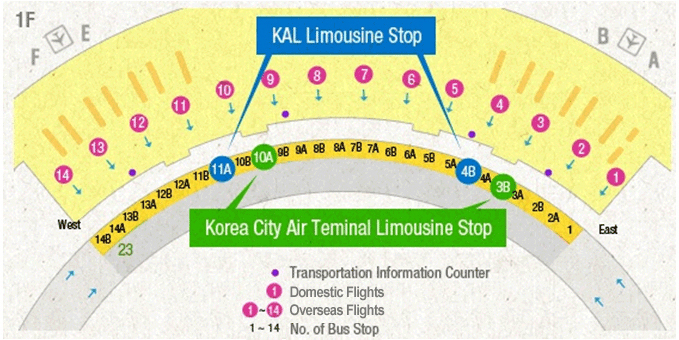 Take a free shuttle bus at Gimpo Int'l Airport curve side to Domestic Terminal. It takes 3 minutes. → Board a plane to Jeju. Arrive at Busan Int'l Airport by an international flight from overseas. Get on a shuttle bus to Busan Domestic Departure Terminal.→ Board a plane to Jeju. 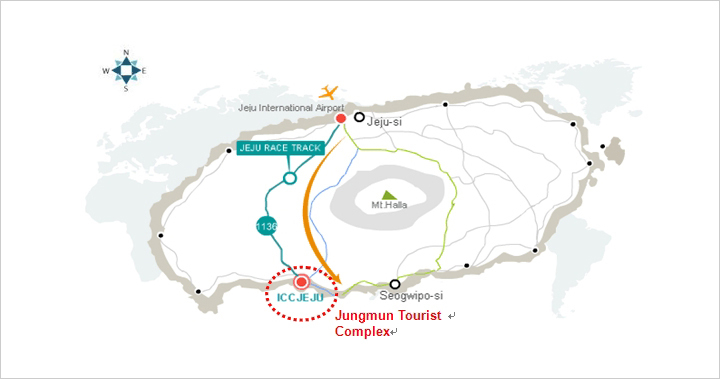 From Jeju Int'l Airport, you will reach ICC Jeju/Hotel in approximately 40-50 minutes by limousine bus or taxi. Fare KRW 4,500(USD 4.2) * Only Korean currency(cash) is allowed. * The limousine bus accepts Korean currency only. Please exchange money at the airport in advance and give it to the bus driver directly. 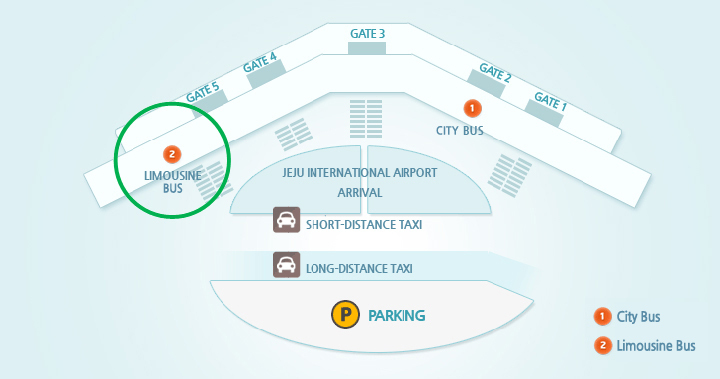 The taxi stand in front of the passenger terminal of Jeju Int’l Airport is divided into two sections: long-distance and short-distance. Advance reservation is recommended for the use of rental cars. You can rent, take over and return a car directly at the airport. Please reserve in advance by telephone or through a website for more convenience.